I have downloaded ur source code of clock widget. You have displayed time on front part. No i want to display few things in lint with scrollbar Can you please suggest for the same? 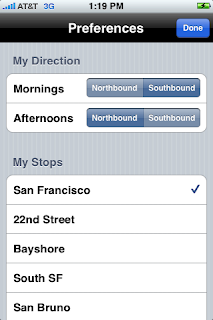 Has the app been updated to reflect the Caltrain schedule changes effective March 2nd, 2009? Yes, it is updated for the March 2nd change. Apple approved the updated App on Wednesday, it should be appearing as a free update to existing users. 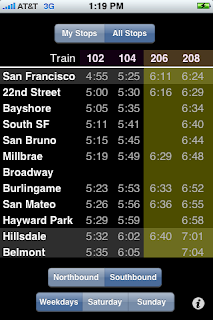 Great app, nice interface, WRONG train time-table. Sergey - The app was discontinued months ago and it should not be available for download int the App store. The time table was correct up to the discontinuation. Where and when did you download it? However, thanks for the other nice compliments. This was a nice app. Thinking about releasing it again? I'd love to update it but since writing the app I've had a kid which has resulted in me no longer riding Caltrain myself and I no longer have anytime to do any development. I'm willing to donate the code to someone to continue it, but note that Apple want $100 to be part of the development program, and that making $100 back on this is actually quite hard. 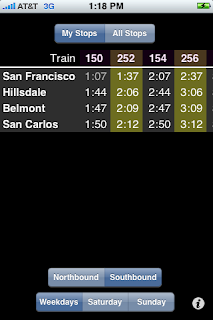 MyCaltrain was the best schedule app by far. Offline access, personalized station lists, smooth navigation. In fact, I still use it and have just memorized which trains have been discontinued! Having just bought a mac and gotten xcode up and running, I'm interested in trying my hand at iPhone development. Updating your app would seem to be a fun starter project that would also be useful to a broader community. If your offer to share the code still stands, please drop me a line. Hopefully my info will be shared with you when I make this post. Wendy Ju has taken the time to update the app with the new timetable and add a nicer icon. This app can be extremely helpful. The only request would be to update the time table as the schedule on the map doesn't match with the schedule on the app.